Click here to get the solutions to the Samurai Sudoku from The Washington Post. Luette, no, I’m not sick, I was away. The Washington Post Samurai Sodoku answer has been posted and the Samurai puzzle will be published on Saturday. Sorry for this glitch. Sorry, I’m old … not a computer guru. I went to Samurai Sudoku and to solutions. What am I supposed to click on to get the answers to the Washington Post Sunday puzzle. I don’t get it. char, you have to click on the first 4×4 square that has “www.djape.net” written over it. I tried that and it didn’t work….. Thank you for your message. The solutions have now been posted! Sorry for the delay! Is there any way I can get the solution for the Samurai Sudoku from the Sunday Washington Post dated June 26, 2011? It was puzzle 4 that month and was a level 2 puzzle. I can’t find it in the archive. Steven, I sent it to you by email. 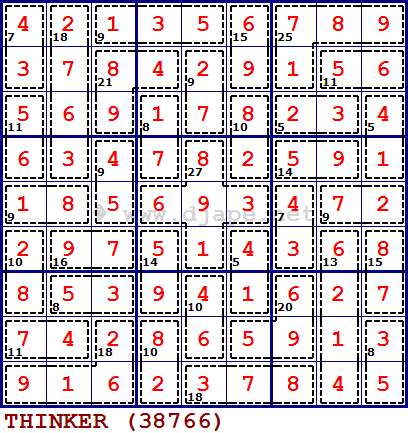 How can I find the solution for the Feb. 5, 2012 puzzle? Any suggestions on getting the archive to work would also be appreciated. Kokuanani, seems like the Samurai Sudoku from The Washington Post archive was down. I fixed it now. Please let me know if you can access it. Is the solution for the Saturday, Feb 18, samurai online? I think I copied it down wrong. Today is the 21st and the solution for that puzzle is already available. Sorry, it’s no longer online. It’s April 4, 2012 and I don’t see the solution for the March 18, 2012 puzzle. I cannot find the solution to the May 20, 2012, samuai sudoku. Thanks. The solution posted on your website does not appear to be the correct solution for the puzzle published in The Washington Post on Sunday, July 8, 2012. Could I please get the correct solution? Carolyn, thanks for pointing this out. I am desperately trying to purchase Killer Samurai Sudoku 100 puzzles No.4 I live in Mozambique but have delivery address in South Africa. PLEASE tell me how do I order this book Online. When you login to your Amazon account and add your book to the cart, you can later modify the delivery address. It’s a standard procedure, shouldn’t be a problem. P.S. I still have not been able to solve one correctly – close but no cigar! I’m looking for the solution to the Samurai sudoku in the Washington Post on Sunday Jan 13th 2013. I notice that there have been some similar requests for old solutions and I’m hoping that I will strike lucky. I was visiting my son in DC just after Christmas and saved the Samurai Sudoku for a rainy day but now that I have finally attempted it I have made a slip and cannot face the thought of starting all over again! Fingers crossed! Looking for the solution to the Mar 17, 2013 puzzle. The one posted now is not the one. Hi – I completed the March 24th Samurai and cannot come up with a solution that does not require guessing. Specifically, the bottom left hand grid with some intermittent squares to the top that need either a ‘1’ or a ‘3’ to complete. I have never had to resort to guessing but neither myself or my husband can solve this one. It’s driving me crazy – is there any way you can explain? Thank you! Janet, could you please send how far you can get without guessing and then I’ll explain from there? I mean, send the position you can reach, all the numbers you have filled in up to the point where you had to guess. It looks like the WashPost solution posted by you on Tues has not been correct for the last few weeks. Have you stopped posting the Washington Post Samurai Sudoku solutions on Tues? I’m having trouble finding a link to former Sam Sud’s…specifically the one June 23rd. Would you kindly share a link to that? Thanks!! Old Samurai puzzles are not available. Sorry. They should become available as of next year in form of a mobile/tablet game. More about that soon! I cannot access the solution for the Tuesday 26, 2013 samurai on the solutions page. What am I doing wrong? Where are the solutions to the February 2,,2014. Samurai Sudoku? I can’t find them in the Washington Post archive, nor did I find any solutions. Usually they are published by date. What is the problem? Have you stopped printing them? I am looking for the solution to the samurai sudoku in the Washington Post June 1. I don’t see it on the solutions page and the “archive” link:http://www.djape.net/category/washington-post/” seems broken as the page isn’t found. Can you help with this. I’ve enjoyed the puzzle and have yet to solve it. Leslie, thanks for your message. You should follow this link to access the solution to the samurais from The Post. The Feb 8 solution is not posted. Is it possible to get past Washington Post Samurai Sukoku puzzle without subscribing to the Post? Holly, unfortunately no, the deal with The Post is such that they have exclusive rights for those particular puzzles. However, you can, of course, buy one of my Samurai Sudoku books which contains the samurai puzzles of the same quality. Your puzzles have literally changed my life–for the better as in 3-4 hours a day enjoying your Samarai puzzles (as well as other authors’, usually freebies online), but yours are definitely THE BEST (especially love diagonal samarais). I started with your Wash Post puzzles after I had to retire early due to disability, and have bought all of your samarai books–I’ve repeated several , and am now buying book 6 for the third or fourth time! I have an intractable pain condition, and doing the puzzles and concentrating on something helps ease the pain almost as much as my various medications. 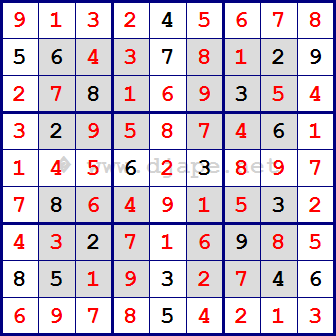 I don’t know if you “invented” the samarai Sudoku form, but I LOVE them. Now, for the worse, my addiction, and it truly is, have definitely affected how clean my house is, how my landscape is maintained, etc., but hey, a drug-free pain reliever tops everything. Thank you! Sharon, thank you so much for your message. I really don’t know what to say and how to reply. I am humbled by your words. I hope your condition improves and I think that a clean or not-so-clean house is a lesser issue. Hope all is well with you and that you will keep enjoying solving my puzzles. Where is the solution for Sunday 1/3/16? Where is the solution for Sunday 1/17/16? Hi Where will I find solution for Samurai on June 26??? Trying to find instructions for a certain puzzle in Loco Sudoko. Found Loco Sudoko by accident. So I bought the book. Had no idea there were such brilliant and devious[I say with love] puzzle makers/maker around. Really love it, Having trouble trying to figure out the patterns for Greater Than/Less Than. Can you help?